As soon as they enter the New-York Historical Society Museum and Library, visitors are likely to feel they’re in the presence of, and perhaps even part of history. This owes to a video wall from Planar Systems that showcases traditional artwork in a unique, interactive manner, creating a memorable experience for visitors to the iconic facility. Adjacent to the museum’s admission area, the Planar video wall depicts a stationary image of a painting called ‘Pulling Down the Statue of King George III,’ by the artist Johannes Adam Simon Oertel. When even a small group of visitors stands in front of the video wall, sounds can be heard and the image then begins to move. As more people gather, the crowd depicted in the painting comes to life and pulls on a rope, bringing the King George statue to the ground in a cloud of dust and amid sounds of cheering and dogs barking. All of this occurs as a result of the Clarity™ Matrix MX55 LCD Video Wall System, which is integrated with ceiling-mounted motion-detection cameras, and software provided by the Cambridge, Mass.-based Small Design Firm. It also reflects the installation expertise of the international system integration company, Electrosonic, which for many years has specified and installed Planar video wall technology for a wide variety of applications. 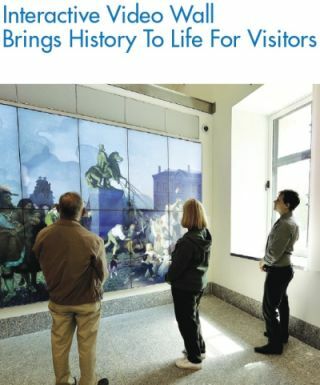 Installed by Electrosonic in the fall of 2011 – as part of a 21st-century update to New York City’s oldest museum – the Clarity Matrix video wall is comprised of ten tiled 55” LCD displays, in portrait orientation, in a five-wide-by-two-high configuration (5x2)—image-to-image gap is just 5.7mm. Andrew Kidd, who handled client liaison for Electrosonic, says the video wall makes a large impact in a very large space.